This year I came back for my third semester of working at the diner. My co-workers are nice and it’s a fairly simple job. You smile at people and hand them their food. Most of the students here are polite. The only trouble is when you get your pleasantries mixed up. For example, if a customer says, “Have a good shift” and you say “You too.” Of course, the second after you say it you realize that they don’t have a shift and you wince a little. You meant to say something nice; you just used the wrong words. We’re getting a lot of new people at the diner this month so I thought I’d write some tips on how to work there. Like I said, it’s relatively simple. As a student worker, all you really have to do is have a positive attitude and show up passably awake. That being said, here are my tips. Be yourself. I heard this at the customer service training session we did and it seems worth repeating. Customers don’t want to be served by a robot or someone who sounds like the lady on their GPS. For one thing that lady is really bossy. This may happen in the next fifty years as technology progresses, but in the meantime feel free to relax and joke around a little. Don’t cut towards your fingers. If you do, you may find yourself with one less. Eat before your shift. Or else you could end up trying to cram a cold tortilla into your mouth during the one o’clock rush. Trust me, it’s not good. Bring comfortable shoes. This job is all standing. If you’re spraying the warming pan on top of the stove and the stove is on, a jet of fire may shoot up. This looks really cool but make sure to get your hand out of the way if you don’t want it charbroiled. I was in Seattle a few weeks ago, where I met up with a friend from the university. He picked me up from my downtown hotel and we drove to Beth’s Cafe, a breakfast restaurant known for its 12-egg omelets and the crayon drawings that line its walls. The drawings showcase a range of artistic styles, from remarkable reproductions of Elsa (of Frozen fame) to Dalí-esque surrealisms. My favorite drawing was of two stick bugs, wading through a puddle of rainwater that had accumulated in a crack in the sidewalk. The bugs were indistinct brown sticks, each with six legs. The drawing struck me because it appeared to be the work of six year old who used too much purple crayon. Yet it evoked solitude with an intensity unmatched by any other drawing that I saw. It may have been the color, or a combination of color and visual understatement, but the figures of the two stick bugs seemed to represent a shared lonesomeness. We finished our meals and drove to nearby Green Lake. There was a boat rental hut, where we rented a blue two-person pedal-boat. We hopped into the water and got into the boat that was waiting for us. I tightened my life-vest, and we began to pedal. There was more resistance than I expected, and I felt my thighs tighten as we pedaled out onto the water, leaving a V-shaped trail of ripples behind us. We talked about our summers. I spent a lot of my summer alone in a library. It’s not a bad thing. Alone, but not lonely. I realized that college, for all the social attention, often is a solitary activity. I study with friends less often than I did in high school. I eat lunch, and sometimes dinner, alone, which, I should stress, is not a bad thing. I think college calls for a healthy amount of solitude. Of course, it also calls for interaction, but I think that solitude is underrated. In the middle of Green Lake, my friend and I drifted, our feet drying upon the pedals of our $18/hour rented pedal-boat. We weren’t especially thin, having eaten more than our fair share of eggs, hash browns, and bacon, but in every other way we were like the purple stick bugs of a six year old, alone on a boat in the middle of a lake. I could have sighed and my breath would have vibrated the water. That Lizzie Life: A Summer in Roma! Hello first semester of senior year! It’s good to be back. This summer was particularly eventful; I spent the first half of it living that Lizzie McGuire life abroad in Italy! Last semester, I was lucky enough to have made it into a brand new connections class called Rome: Sketchbooks and Space. This class was based in the study and appreciation of ancient Roman art and architecture, focusing heavily on sacred spaces and the utilization of space as a whole. Throughout the semester each student also worked on a sketchbook with weekly entries. As an art major, I thoroughly enjoyed this aspect of the class, though it wasn’t all art majors in the class. The classroom part of the course was very interesting… but the best part was going to Italy for the first three weeks of summer. You heard me, Italy! Our entire class lived in Rome– along with our fabulous professor and official guardian angel, Elise Richman– and worked in the Rome Center studio spaced owned by the University of Washington. 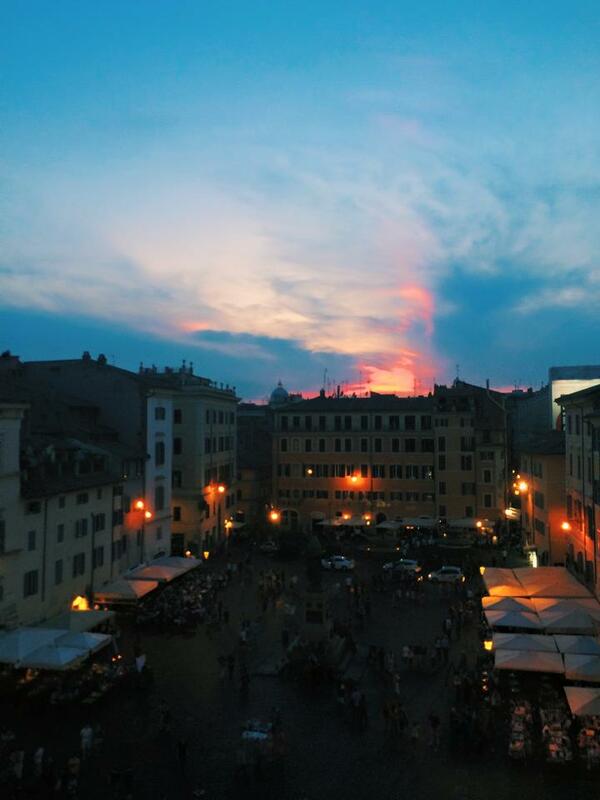 The Rome Center was right in the middle of the beautiful Campo di Fiori, a bustling marketplace during the day and vibrant city life scene at night. I used to sit in this one particular windowsill and look out onto the square… and people used to take pictures of me in my little spot! I guess it is pretty rare to see a redhead in Rome. Here’s the view I had from that windowsill one night as the sun was setting. Stunning. On the last day of finals week last semester, a friend and I, to celebrate the end of the school year, drove to North Bend and hiked Rattlesnake Ridge. We got there early, before the morning fog had lifted, and so, for the most part, we hiked in a cloud. Though the sun was out by the time we’d reached the ridge’s 3,500-foot peak, the fog covered the surrounding areas so that, where we should have seen the forest and Rattlesnake Lake below, we saw only gray. There were others at the peak, taking pictures, sitting on lawn chairs, and watching the rodents scramble across the rocks. My friend and I found a ledge near the edge of the peak and sat, as wisps of fog passed around us. I pulled out a couple of granola bars and we ate. I wish the fog would go away, my friend says. The view is incredible. And it puts how high we are in perspective. A part of me wishes that I could see the view, too. But the sensation of being a kilometer above ground doesn’t abandon me. I gaze into the impenetrable fog from my perch. I don’t know, I say. The not being able to see is kind of cool. In a sense, it makes me feel that we’re even higher. Too high to see the ground. My friend unlatches his camera bag. He points to a chipmunk, nibbling a nut on a pedestal-like rock. For an instant, the chipmunk looks at us, long enough for my friend to take a picture, then it darts over the ledge and slips into the fog. I stand and peer over the ledge. There’s no trace of the chipmunk. Then I notice a man, walking on a thin outcropping of rock on the side of the cliff. Check this out, I say. My friend stands and looks in the direction of the man. That guy’s insane, I say. He must not be afraid of heights. The man lowers himself and sits with his back against the mountain-face. He hugs his knees to his chest and leans forward. As he cranes his neck to see the trees below, a thick cloud of fog envelops and shrouds him from view. We watch. The fog thickens around the mountainside. Then we hear a scream, muted by the cloud, as if from a distance, and it echoes down the mountain, into the valley, and ripples over the lake. I think the worst. I think, This man has fallen to his death. The people turn. They inch their way to the edge of the peak, as if afraid to see what awaits their eyes below. The cloud of fog passes. The man still sits on the narrow strip of rock on the side of the mountain. The people let out sighs of relief. He shivers. There’s sweat, or dew, on his forehead, but he’s there. I sit back down and lean against the rock. I realize that what I thought was a scream was a shout, or a cheer, his thrill at sitting blindly in a cloud, at knowing but not seeing, and seeing what we don’t know. We watch the fog pass beneath us like a slowly moving stream and imagine that we’re on an island, floating in the sky. Last November I made the decision to life off-campus. I thought THIS is what college is about! That THIS is independence that so many people at UPS do this, why not me? Luckily I already had five other friends I knew I would want to live with. That my friend, Nihal already has the experience to house-search, setting up bills and everything. Our house search was basically set up by her, since she spent that year living off campus she knew what to look for and what we should consider. There were many factors including- having six rooms, near to campus (or well reasonable since four of them had cars), cost and size of the house. We started our search through the trusted off-campus house search directory through our University. All the property owners/managers are trusted by the University and know they are offering housing to college students and have a good response from previous students experiences. The sea in Hawaii is as green as it is blue and rides onto mounds of golden sand, molded by the feet of passerby who carry their shoes and roll up their jeans. Waves overlap waves like sheets of ice floating on the Antarctic sea, sliding over one another like clouds. The sea leaves behind flowers of foam on the sand, which dissolve under the heat of the sun. At dusk, the sea sings the colors of the sunset, purple and red and hazel under balmy skies. The sea in Hawaii sparkles in moonlight and rolls in the breezes of the night. It rocks itself to sleep, as the wind whispers its breathless coo. Years ago, I threw a bottle with a message into the sea. The sea only reaches Tacoma through the Puget Sound and maybe through some rivers. On the rocky, black-sand shore of the sound, crabs scurry into crevices between stones, carrying with them the detritus of the sea. Tongues of seaweed wash ashore, covered in slime, where they harden slowly under the mild sun. The water of the Puget Sound drops fragments of shells and crabs onto the sand, where they remain half-buried, like the statue of Ozymandias in the desert. But the shore of Tacoma is not a desolate place. The Puget Sound is quiet, and birds rest on the wooden pillars of piers that have known older days. I think that, if I were any good at it, I could skip a rock that would hop infinitely by feeding on the stillness of the sea. I think of these things as I sit in the SUB, alone at a table with five other seats. I’m holding a bottle of soda to my ear and listening to the sea inside of it. At times it sounds like the sea in Hawaii and at others the waves of the Puget Sound, which I suppose, for all their differences, don’t sound that different. Maybe the sea is getting back to me, in response to the message I tossed it years ago. But I don’t know what it’s trying to say, and my friends take their seats, so I lower my bottle and leave the waves for another time. The next day, I drove to my childhood school, which is nestled in a valley between mountains that are a thousand shades of green. When I got there, it was raining, so I parked underneath some trees. I leaned against the window and watched the rain drip from the branches onto the windshield of the car. The rain slid down the window, etching rivulets into the glass and running shadows onto the dashboard. I watched a man drive a lawn mower over the grass, and the grass bent and cracked beneath the blades. Then a bell rang and doors opened and children ran onto the blacktop basketball court with balls and jump ropes and Chinese jacks. And for a moment, I realized that, though I wasn’t, my memories had led me back to a place that I had known in a previous time. I spent most of my summer at the University of Hawaii at Mānoa, where I read, researched, and wrote an essay about Roberto Bolaño’s posthumous novel 2666. My research was funded by the Arts, Humanities, and Social Sciences (AHSS) summer research program, which allowed me to sit in a library all-day, doing things that I love to do. For me, this entailed reading a challenging, but rewarding, novel and what a bunch of people much smarter than I had to say about the novel, and writing to seem much smarter than I am about a novel that is much smarter than I. The project was an exercise in independent learning, and I recommend the program to any student with a desire to do something intellectually stimulating over the three-month summer break. (There is a similar research program for students interested in research in mathematics and the natural sciences.) The great thing about the program is that the student has full creative control, choosing everything from the scope of the project to its end product. This is how I was able to write about the book of a Chilean who may never be taught in an undergraduate class. The program also posts completed projects to Sound Ideas, the online repository for Puget Sound students and faculty, and so represents a publication opportunity. I will be presenting a poster on my research at the AHSS symposium in Collins Memorial Library later this semester, alongside the 27 or so other AHSS summer research scholars, whose projects are ambitious, sophisticated, and meritorious. When I was not writing and reading for my research project, I was writing and reading for fun. To celebrate a friend’s birthday, I put together a collection of poems that my friend and I had written over the past year or so. Using a publishing program called Blurb Bookwright, I printed the collection and had it bound in hardcover. I fancied the book by including professional-quality pictures from an online, attribution-free photography website called Pixabay (which also has nice wallpaper photos). The book featured twenty poems, ten of my friend’s and ten of mine, and a foreword and afterword (which were extraneous, to be sure, but gave the book some credibility) written by two other friends of ours. Needless to say, my friend liked the gift. I did a modest amount of reading outside of my research. Of the books that I read, my favorites were Witold Gombrowicz’s Cosmos, a smart, dizzying rumination on the ideas of chaos and order, and Jerzy Kosinski’s The Painted Bird, which is written with the audacity and power characteristic of Nabokov. I recommend both—and 2666 while I’m at it—though neither is exactly palatable, which, I believe, is the point. I also, at the beginning of the summer, received a signed-copy of Kazuo Ishiguro’s The Buried Giant as part of a pre-order special through Barnes and Noble. I must have spent as much time examining Ishiguro’s signature as I did reading the book. His signature is plain, like his prose, which I think is fitting. It is also tilted, as if behind the cleanliness sits an unreliable narrator, with a tilted smile. Opening the book to Ishiguro’s signature made the reading that followed more personal, and throughout the novel I found myself flipping back to the title page, as if the signature constituted an interpretive key to the book. In the end, I suppose, it served only to mock. I have talked for long about my summer, when in fact I never strayed from the library. My summer didn’t take me to many new places, as some of my friends’ summers did (Spain, China, New York), but it did challenge me to envision all of these places through books, and it did enable me to learn a few things along the way.